How time flies – just one day left to the release of The Legend of Zelda: Breath of the Wild DLC Pack 1: The Master Trials! In Nintendo’s penultimate post, we find out about the Majora’s Mask backstory and its ability in the game. The Majora’s Mask is only obtainable by purchasing the DLC Expansion Pass. By wearing the Majora’s Mask, common enemies such as Bokoblins, Moblins, and Stal, will become friendly towards Link. This is the same effect Kilton’s masks offer, but it’s much more useful since it targets three enemy species at the same time. Nintendo recommends players to try using it if they aren’t good at combat. Check out the full backstory and details from Aonuma below. Hello, I’m Aonuma, producer of The Legend of Zelda™: Breath of the Wild. The Legend of Zelda: Majora’s Mask was originally released for Nintendo 64™, and the remake was released for Nintendo 3DS™. Majora’s Mask is the scary, cursed mask mentioned in the game’s title. When you acquire this mask in the Master Trials and equip it, it has the effect of making minor enemies like Bokoblins, Moblins, and Stal enemies think that Link is part of their group, so that they won’t attack Link. (Although Kilton might complain: “You’re hurting my business!”) If you’re not good at combat, I recommend you try this mask out. 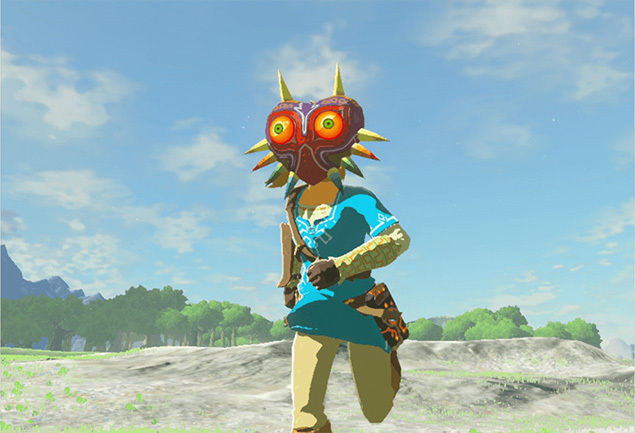 The mask’s design is true to the original, but its size was been modified many times to match the size of Link, as if he’s Skull Kid wearing Majora’s Mask. It looks even more creepy at night… But don’t worry—the moon will not fall in this game. OK, tomorrow is the release day. The director for DLC, Tominaga, will update this post next.